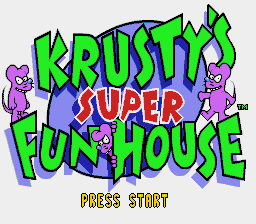 Krusty's Fun House, known as Krusty's Super Fun House on 16-bit consoles, is a platform puzzle game developed by Audiogenic Software and published by Acclaim. It stars Krusty the Clown from the popular The Simpsons TV show, who is tasked to rid his fun house of rats. The clown must lead these rats into numerous traps set up by Homer and Bart Simpson, as well as Krusty's assistants Corporal Punishment and Sideshow Mel. The game was originally developed as Rat-Trap for the Amiga, without any ties to the Simpsons franchise, unlike other Simpsons games both before and after. Krusty's Fun House was an early Simpsons game, debuting in 1992. As such, the characters had not been fully developed, so at this point Krusty was simply a happy smiling clown rather than a man haunted by addiction and a dark past. In Krusty's Fun House, players control Krusty the Clown with the objective of leading sets of purple rats to traps spread across the stage. The rats continously walk forward - they can climb up single tiles, but will reverse if a wall is more than one tile tall. If a raat walks into a trap, it will be killed, and once all the rats are removed from the stage, the the level is considered complete. Krusty's Fun House is split into five sections, but the levels within those sections can be tackled in any order (all must be completed for the next section to open, however). Krusty can run and jump, pick up and put down items such as blocks, and throw a limited supply of custard pies (or superballs), which can be used to get rid of enemies. There are also other stage hazards which need to be avoided, as well as features such as springs and blowers which can determine where the rats go. Krusty will also take damage if falling from a tall height. Levels in Krusty's Fun House are often much bigger than they need to be, owing the the inclusion of other items and "magic blocks", which if found, can lead to secret levels. Developed by: Audiogenic Software Ltd.
Main article: Krusty's Fun House/Magazine articles.